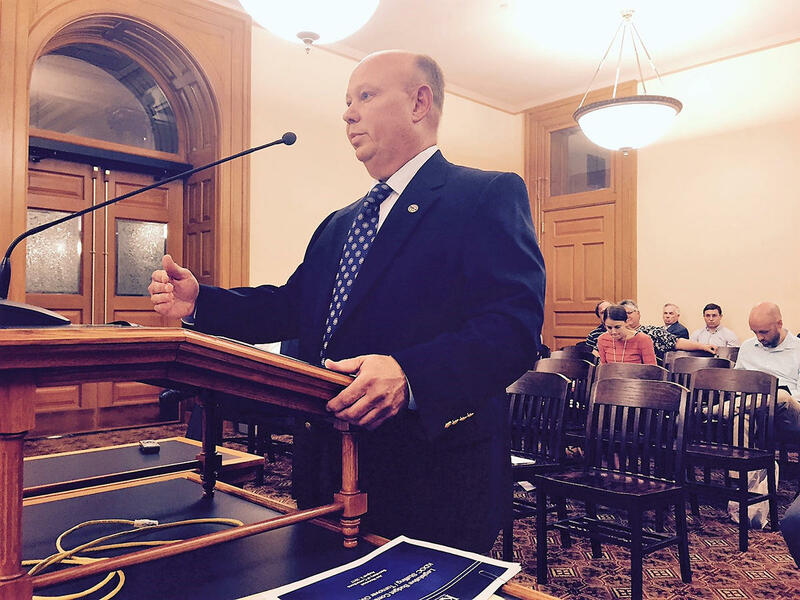 Some lawmakers say mismanagement of the Kansas prison population is contributing to unrest among inmates. But Corrections Secretary Joe Norwood, pictured here, instead sees a connection between inmate unrest and the political tumult in the country. The head of the Kansas Department of Corrections says he sees no connection between last week’s riot at a prison in Norton and disturbances earlier this summer at the state’s El Dorado prison. But some lawmakers are charging that mismanagement of the state’s prison population is contributing to the unrest. Sen. Laura Kelly, a Topeka Democrat, said the department’s effort to clear the way for the demolition of a medium-security facility at Lansing has led to the “haphazard” movement of inmates throughout the system. “I’m convinced that it’s been the unplanned, rapid rotation of inmates from one facility to another that has created this chaos that we’re having in our correctional system right now,” Kelly said. The concerns are bipartisan. Senate Ways and Means Committee Chairwoman Carolyn McGinn, a Sedgwick Republican, has criticized Corrections Secretary Joe Norwood for withholding information from lawmakers about the severity of incidents at the El Dorado prison. Samir Arif, a spokesperson for the department, acknowledged that hundreds of prisoners had been moved over the course of the summer but said officials don’t believe that the mixing of inmate populations prompted the recent disturbances. However, Norwood sees a connection between inmate unrest and the political tumult in the country, which has spawned demonstrations that in some cases have resulted in violent clashes. Dismissing that explanation, Kelly said it showed “the department isn’t taking any responsibility” for the recent violence. According to portions of the prison log obtained by KCUR, inmates at Norton set fires, smashed windows, commandeered prison vehicles and attempted to run over a guard. They also fashioned weapons out of chunks of broken glass before guards quelled the disturbance by threatening to use lethal force. Similar to the incidents at El Dorado, Kelly said corrections officials attempted to downplay the severity of the Norton disturbance. That, she said, is further eroding confidence in Norwood and his management team. “I haven’t surveyed the bulk of my colleagues, but the ones I have talked to are concerned and do not have confidence in the current administration at the Department of Corrections,” Kelly said. High turnover among corrections officers is also a factor in the disturbances. The annual turnover rate among uniformed officers across the system is 33 percent and nearly 50 percent at the El Dorado prison. Last month, Republican Gov. 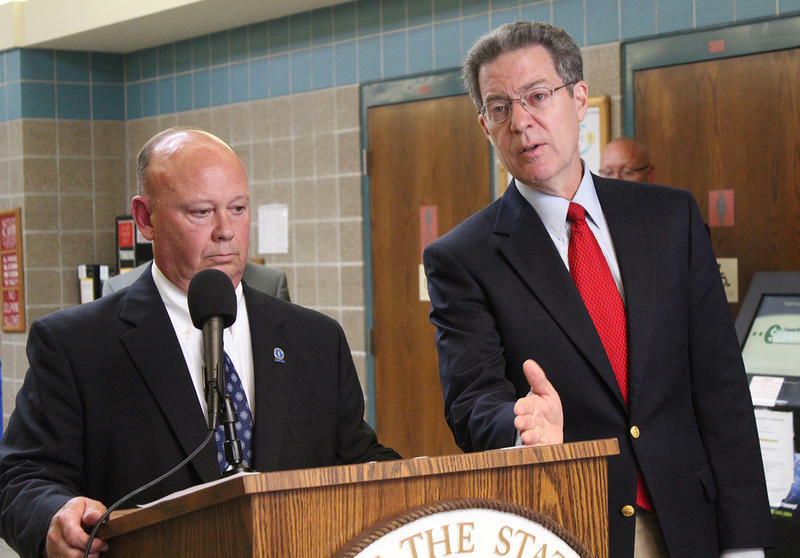 Sam Brownback ordered an immediate pay raise for guards to help fill the vacancies. Jim McLean is managing director of the Kansas News Service, a collaboration of KCUR, Kansas Public Radio and KMUW covering health, education and politics. You can reach him on Twitter @jmcleanks. Kansas News Service stories and photos may be republished at no cost with proper attribution and a link back to kcur.org. Inmates turned over a tactical response vehicle, made weapons out of broken pieces of glass and tried to run over a corrections officer with a commandeered cart during a riot Tuesday night at the Norton Correctional Facility in north-central Kansas, according to a copy of the prison's log obtained by KCUR. The threat posed by inmates was serious enough that, at one point, responding officers were told to use lethal force if necessary. Kansas Gov. Sam Brownback announced immediate pay increases for corrections officers during a news conference Thursday afternoon at the state prison in El Dorado. Brownback said all officers will receive an immediate 5 percent salary increase, and starting pay will be increased across the corrections system. The hourly pay rate for entry-level corrections officers will climb from $13.95 to $14.66. At El Dorado, where the staff vacancy rate is 47 percent, the hiring hourly rate will go from $13.95 to $15.75, he said. A state senator is pushing for a legislative investigation of recent uprisings and disturbances at a 1,500-inmate prison near Wichita. Sen. Laura Kelly, a Topeka Democrat, on Monday proposed having legislative auditors look into incidents at the El Dorado Correctional Facility on at least four separate days in May, June and July. Staffing shortages at the El Dorado Correctional Facility are creating unsafe working conditions, according to the head of the union that represents state workers. Editor's note: This story was updated at 6:45 p.m.
A Kansas Department of Corrections spokesman said Thursday evening that officers at the El Dorado Correctional Facility worked during the day to get a group of inmates to return to their cells. Todd Fertig said in an email that a group of inmates refused to return to their cells Thursday morning. Fertig said the situation was resolved around 5 p.m. Thursday, after backup personnel were called from other facilities.